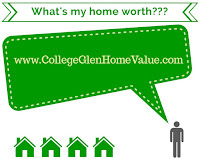 The College Glen real estate market is HOT right now with a total of 13 homes sold last month. Take a look at these stats of homes sold for the month of May 2018. Currently there are 7 Active listings and 12 Pending sales in escrow.